Harlem, New York, NY. New York City, known for its multitude of free events in public parks during the summer, has a growing number of unusual, niche events in less traveled urban spaces. 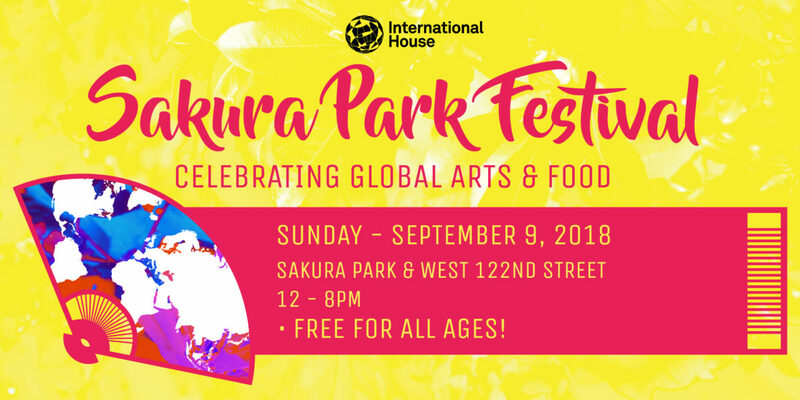 On September 9, the 2nd Annual Sakura Park Festival will host premiere artists, performers, and chefs for a full day with live, hands-on experiences for the area’s college-age students and families. This event is presented by International House 12-8pm, with a 6:30pm performance by Jazzmobile. This free event features nationally recognized artists such as Affiniti NYC, National Double Dutch League, Mehndi NYC, and a surprise performance from some of Broadway’s finest as well as food and drink vendors from global cuisine vendors such as Pisticci and Bettolona. Attendees will enjoy lawn games, learn the newest dance moves, and create their own artwork. Organizations such as International House, Columbia University, Manhattan School of Music, Riverside Church & Teachers College will meetup and community groups will engage festival-goers in what makes Morningside Heights, West Harlem such a vibrant neighborhood. The Festival will be held in Sakura Park and West 122nd Street, between Claremont Avenue and Riverside Drive. Map link: https://goo.gl/maps/HfXjWyNWBmL2. For more information, visit the event website at https://www.facebook.com/events/306773036729045. The event’s presenting sponsor is International House, home to the next generation of globally-minded leaders in business, the arts, politics and more. Each year, 700 scholars, fellows and young professionals from 100 different countries representing dozens of fields of study come to live, learn, collaborate and grow together under our roof in a values-based culture of respect, empathy and moral courage. More than just a place to live, I-House is a vibrant global community and an unforgettable experience. Morningside Area Alliance, a membership association of the area’s academic and cultural institutions. The School of Professional Studies at Columbia University spans the continuum from high school and pre-college students through lifelong learners with innovative offerings at the highest levels of academic excellence. About Sakura Park: The Park, named after the famed Sakura Park in Tokyo, is set atop Morningside Heights and is adorned with shady cherry trees, a central bandstand, and stone walls. Located between Claremont Avenue and Riverside Drive, the Park is an oasis situated between some of the world’s leading institutions including International House, Manhattan School of Music, The Riverside Church, and Union Theological Seminary.